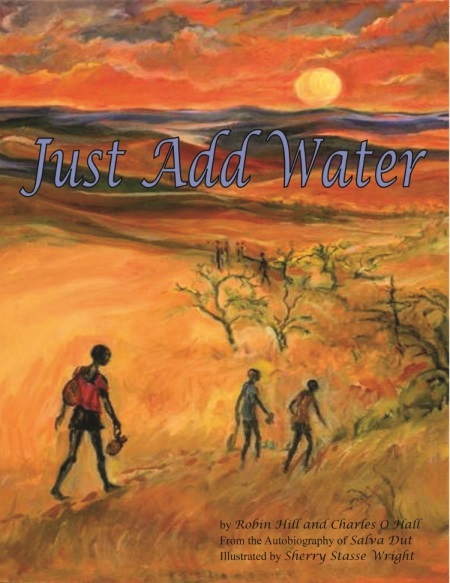 Just Add Water is the true story of Salva Dut's journey from South Sudan to the founding of Water for South Sudan. It is a story about a son's love for his father, a journey of hope, and a desire to improve the lives of others with the gift of clean water. It recounts Salva Dut’s journey as an 11 year old boy fleeing his home to escape a civil war, his struggle for survival as a "Walking Boy" in the harsh landscape of South Sudan and as a refugee in camps in both Ethiopia and Kenya. Salva's journey seemingly ends in America until he discovers many years later that is father is alive but ill, and that life for his people back in South Sudan is extremely difficult in part due to the lack of clean drinking water. Salva’s journey then comes full circle as he returns to South Sudan to reunite with his father and transform the lives of his people with the simple gift of water. The book is written for third to sixth grade reading levels. You can see a sample excerpt of the book here. Buy online (Click the small Just Add Water cover below) or pay by check. Please send a check made out to Water for South Sudan, Inc. to Water for South Sudan, Inc., PO Box 25551, Rochester, NY 14625, USA. Write "Children’s Book" on the check's memo line, and make sure to include a note with how many copies you want. Special bulk discount rates are available. Orders of 10 books or more will be sold at a rate of $5/book, and orders of 25 books or more will be sold at a rate of $4/book. Select the bulk order options before you add the item to your bag. Shipping Shipping is free for all US destinations. For international orders, please contact us at admin@waterforsouthsudan.org for shipping cost and payment instructions. Thank you!